An American girl in Singapore: How am I the weird one? I was having a conversation with my Singaporean coworkers today about table utensils. We often talk about random things. It makes for the most interesting conversations, as you will soon read. The conversation began with me feeling bad about continually using plastic utensils at lunch that I just throw away after each use. It's not very green of me at all. So I told them that I wanted to find some inexpensive metal utensils, but also didn't want to have to buy a whole set either. Singaporean 1: Oh, dat's ok Megan. I just bring some in for you. What you want, just a spoon and fork, lah? Me: You know, I really just eat with a fork and knife. I rarely use a spoon. Singaporean 2: Oh that's right. Typical American. Always eats with a knife and fork. Me: Yes, because I need a fork to cut my food. Singaporean 2: You use a spoon for that, just like the rest of the world. There they go again. Americans always have to be different. Me: What? The rest of the world uses a fork and knife too. It's common sense. When you need a utensil to cut something, you use your knife. Singaporean 2: You can use a spoon! The spoon works just as well to cut. Me: Why would I use a blunt, round utensil to cut when a knife is made for just that? Singaporean 2: Nevermind you, it's a British thing. Me: The British do that? I thought they used a knife and fork too? Singaporean 2: No no no. That's just an American thing. Ok, I call Bullhonkey. This cannot be just a weird Americanism. So I consulted Google. In fact, I've been Googling this issue for over an hour. This is what I found: The Brits use a knife. Proof is here. In fact, most American table manners are derived from Britain. Also, most of Europe also uses a knife. Not only that, but only in Southeast Asia is it even acceptable to hold both a fork and a spoon at the same time while eating. But that's not really the issue we're discussing here today. I'm still stuck on the whole "knife is better than spoon" pish posh. Where on Earth did Singapore get the idea that a spoon is a better cutting utensil than a knife? I know it's not just my coworkers that think this way. It's a collective opinion in Singapore. Not a single hawker stall that we've gone to has provided a knife. It's either a fork and spoon, or a spoon and chopsticks. Knives seem to not exist here. It's not usually a big deal as most Asian food is served bite-sized. However, in the event that they serve you chicken with the bones still in it (which is usually the case), it'd be nice to have a knife to cut it off. We've had many an accident trying to that with a spoon. And by "accident", I mean chicken flying across the table and onto the floor or in my lap. So no. I'm not convinced that the spoon is a better alternate to the knife. Several curry chicken stains to the crotch can count as my proof. BUT, I will say this. Eating Asian cuisine with both a spoon and fork in your hands at the same time has proved to be much easier than the American one-handed utensil method. It's a better rice getter. Forks by themselves just make a mess of rice on your plate. And now I can sleep tonight. asians eat rice at (almost) every meal, so we use the spoon to scoop the rice. 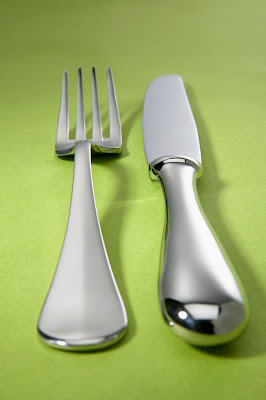 since we use a spoon with a fork, it would be troublesome to keep changing to a knife to cut something. Megan, you're brilliant. I've mentioned this to my wife before. The whole spoon and fork thing is prevalent in the Philippines as well. In fact, I think there are only 3 knives in her family's home, and in the Philippines it's traditional for homes to be multi-generational. 2 of those knives are used for cooking. They're the big kind. Then the 3rd one is a small one, but is also used for preparing. What I mean is, if they grill meat, someone gets the small knife and pre-cuts all of the meat and serves it on the table cut into bite-sized chunks. I was almost insulted the first time I saw that, as though I'm not capable of cutting and consuming my own hunk of meat... but I guess it's just culture differences. I think it's a bit odd that your coworker would try to pass off that odd behavior as being normal, and say that the US is the backward one, when it's easily provable that it's not the case. This reminds me of a recent article on another blog I read, by a Swedish girl in China, where she says that Chinese often tell white lies to smooth over situations. I wonder if this was an extension of that? Well, the Swedish girl said that she caught someone in a lie, and that she's caught them often. Really ridiculous things, like someone saying they brought lunch with them, and then seeing them buying lunch in the cafeteria 10 minutes later. She didn't call them blanket liars. That came from the comments. She's a nice girl and tries hard to be inoffensive. I remember the one time she posted something controversial, she flipped out when people started arguing in the comments. I haven't experienced it myself. At least, not that I've noticed. I can't really agree with your assessment of her blog. Coming from West to East, probably much more so than East to West, a person is likely to find a lot of things that are ... more difficult... than what they're accustomed to in their home country. The things that stand out most to a person are going to be things that grind against what their perceived sense of the "norm" is. Then you have to realize that the very nature of blogs, more often than not, is a platform for gripes and complaints. Tell me it's not.... Besides, she posts as much about the things she likes about China as she does the things she dislikes. No one is going to love everything, and I'm sure that the concerns she expresses are expressed by many Chinese as well. It just sounds different coming from someone who's white. It sounds like a superiority thing. I mean really. Someone accused me of feeling superior, of being racist, just because I said Singapore doesn't have good pizza or good burgers. WTF? It's a matter of personal opinion. Also, in a blog like hers where she's comparing her life in China to what she's used to, it's unavoidable that it will be "us" vs "them". I think it shouldn't be viewed negatively, but instead it should be taken as a learning experience to see how someone from another place views your country. You can't expect the person to love everything. As for the commenters, I think she's probably just practicing being open. She's allowed comments that paint her in a bad light as well, which is better than I can say for myself. I thought I would let anyone comment anything, but then I realized I don't want personal attacks on my blog and deleted them. Of course, posting about Singapore I seem to get a lot more hate than she does posting about China. Anyhow, what I'm getting at is that she's letting people use the comments for discussion. There's a lot of debate about whether or not blog owners should be responsible for the comments made on their site, and I'm totally against it. I think commenters should be responsible for their comments, and that blog owners should let it stand in the interests of open exchange of ideas and information. Whoa, buddy. I think you need a cup of tea. Honestly, if someone told me they didn't like the US, I wouldn't care, especially if it were a foreigner. That might not always be the case, because there are certain elements of American society that are racist and would use it as an opportunity to spread propaganda, given that the vocal party is not white. However, I think most Americans understand the fact that they're not well liked in the world, and that people coming from other countries aren't going to agree with everything we do. The only time I get touchy about that subject is when an American insults the United States. That's totally not cool. You can disagree with policies, but you should never genuinely disrespect your own country. But, you should be liberal in how and what you defend about your country too, because not everything is worth defending. From what I've seen and heard Swedes are no more overtly racist than any other Europeans and certainly less so than most Americans. The way you make them sound, though, it's as if you're describing Nazi Germans. I don't recall them voluntarily being part of that camp. Or even welcome to it. @tc. you seem an intelligent guy but hurling such racist remarks plus using the word "puta" to refer to the swedish person contradicts a lot about that "seeming" intelligence. how would you feel if someone referred to you as a "bo lan chao'? are you seriously gonna stick to racist generalization because of one comment that was not even intended to depict all chinese people? if that kind of branding "all the tomatoes are bad coz one is rotten", then you have just spoiled the whole crate of your race too! oh no, ikea is swedish right? so you sure you dont want any ikea products again ever?? I say you settle this like it was meant to be settled! A BATTLE OF KITCHEN UTENSILS! You get a knife, you challenger a spoon. You fight TO THE DEATH. Let's see who wins! Wow - this falls into the "learn something new everyday" category. I haven't traveled to any other "foreign countries" besides Canada and they seem to like spoon, fork, knife arrangement. I'll have to ask Hubby-honey how this works. He used to be in the Navy and has traveled more than I have. I guess it depends on what dish you will be eating. Me and my husband ate at Amigo's, a hawker steak stall at Pasir Ris, and they gave us a fork and a serrated knife. Well just a few people came up with that whole spoon cutting nonsense, that doesn't mean the whole of Singapore takes that as sense. I'm pretty sure your coworkers don't equate to Singapore. And sure enough, we use a knife for cutting, we as in the general public, exclusive of people who aren't familiar with western practices. Rice is a staple part of Asian food. You'll also notice that the viands that often go with it needs to be "scooped". Neither fork nor knife can do that properly so spoon is necessary. Spoon has evolved as a cutting utensil as well since it is deemed troublesome having to continuously switch to a knife. Most western food stalls offer knives most of the time. Just like how they offer chopsticks for noodles.